Oh Pat. 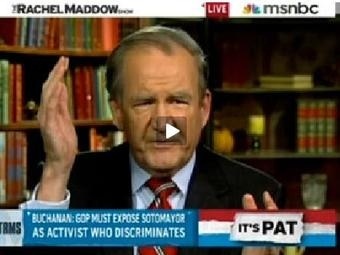 Rachel Maddow had crazy ole "Uncle Pat" on her show tonight to discuss the Sonia Sotomayor Supreme Court nomination and Buchanan went over the dark side with a "white people built this country and deserve more" rant. I think white men were 100% of the people who wrote the constitution, 100% of the people who signed the Declaration of Independence, 100% of the people who died at Gettysburg and Vicksburg, probably close 100% of the people who died at Normandy. This has been a country basically built by white folks. This whole clip is especially cringeworthy because we actually find Buchanan kind of endearing from time to time. He is not anything close to endearing here, and Maddow pretty much slices him up.